Is the weight of being the strong one in your family becoming difficult to manage? To the world everything looks perfect. But your internal world is filled with sadness, stress, and self doubt. You have checked off all of the proverbial boxes of success in life, but you still feel a vast emptiness. Hard for you to experience peace, joy, and happiness you deserve because of the stress caring for a parent who was emotionally absent? The years are flying by quick. You know the time to change is now. If you have reached the point where you desire to thrive in life, and not just survive, I am the therapist who can help you gain the skills and tools to reclaim your life. I am super passionate about helping improve the mental health of people in their thirties and above who are entering, or living in the second half of life. People who remember browsing Borders for books instead of downloading on the Kindle? Recall life using tokens on the subway before the Metrocard? Or remember having a meal without strolling through IG? Remember those days? If this resonates with you I am the therapist for you. People who are now caregivers to aging parents, young children, and juggling careers face the highest levels of stress compared to other generations. Generation X’ers and Xeninals are often forgotten in the mental health space. The goal of my practice is to help address this gap. With over eighteen years of clinical experience using relatable and clinical approaches, I seek to fill a void in mental health for this forgotten generation. My goal is to provide a safe judgment free zone to help support your journey towards living your best life and move beyond survival. 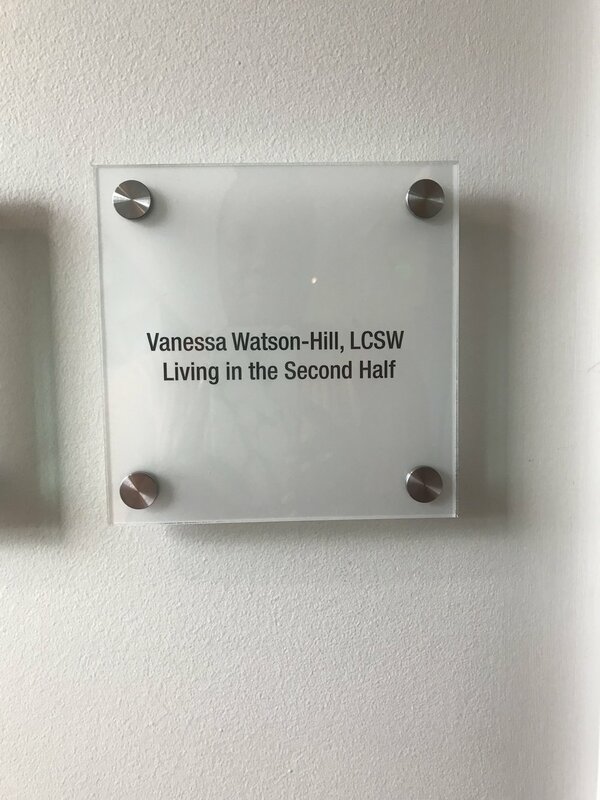 Vanessa Watson is the owner of Living in The Second Half L.L.C a therapy practice focused on helping people 30 and older in the second half of life. Vanessa specializes in helping adults answer questions such as “Who am I apart from being a partner, parent, or employee? or “ What has brought me to this place in life and how can I change? Vanessa is a licensed clinical social worker, John Hartford National Association of Social Work Supervisory Leader in Aging Fellow, clinical supervisor, public speaker and leader in issues surrounding midlife including ; caregiving, chronic medical illness, grief, and aging. Vanessa has dedicated her career spanning 18 years working with individuals, and families. Vanessa from personal and professional experience understands the impact that caregiving has on a person and family. Vanessa brings a deep personal understanding and clinical experience to help those coping with multiple stressors in the second half of life regain their sense of peace and self. The stressors of juggling multiple responsibilities is real! Vanessa received her bachelor’s degree in Black and Puerto Rican Studies from Hunter College, City University of New York, and her Masters’ in Social Work from Fordham University. Vanessa has worked within inpatient and outpatient settings that allowed her to serve in multiple roles, including clinician, palliative care consultant, field instructor to graduate students, clinical supervisor, and Director of Social Work at one of the largest skilled nursing facilities in the United States. Vanessa as a licensed social worker has completed numerous clinical trainings including certification in trauma cognitive behavioral therapy, and most recently completed Level 1 training in Gottman Couples therapy method taught by founder’s Dr. John and Julie Gottman. In individual therapy together we will work closely to form a comfortable and collaborative therapeutic relationship. I provide a safe judgment free zone to help you learn more about yourself, grow, and heal. Together we will work on addressing your current struggles, explore and unpack how your past plays a role in your present life. As we work together, you are always at the center because you are the expert in your life. I will use a number of clinical tools, interventions, and clinical approaches to get you on a better path. Using the Gottman method in couples therapy, we will work together help you identify the patterns and cycles that keep you from connecting. When you come in for couples counseling our first session will be together as a couple to learn about the challenges that bring you into therapy. The next session will be one- on- one, to allow me the opportunity to gain a deeper understanding of your individual upbringing, and other dynamics that may play a role in present challenges. After making an assessment about the appropriateness for couples therapy, we will return to couples sessions for the real repair work together. I look forward to connecting with you! Please contact me at 646 859-0125 or email me at therapyfor@livinginthesecondhalf.com to schedule a free 15- minute consultation. I maintain office hours on Saturday’s only. If you're seeking to use your health insurance, please note that I'm an out-of-network provider. I am happy to provide you with a form you can send in to your insurance for possible reimbursement. That means you’re responsible for the fees at the time of our appointment and, depending on your plan, a certain percentage of that may be paid to you by your insurance company. I encourage you to call the member services number on the back of your insurance card to find out what your “out-of-network” benefit. This will help you avoid any financial surprises. My office is located at 33 Plymouth Street Suite 301 Montclair, New Jersey 07242. If you’re coming into the office I am centrally located in a beautiful, modern, wheelchair accessible office with free on-site parking for your convenience. When you come into the office for your scheduled appointment please feel free to wait in the waiting area, grab a magazine, and breathe. I will be out to greet you at your appointment time.